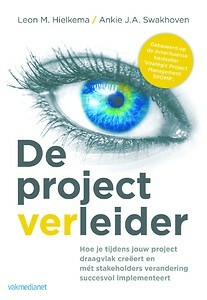 Just read the “De project(ver)leider. Hoe je tijdens je project draagvlak creëert en met stakeholders verandering succesvol implementeert” from Leon Hielkema and Ankie Swakhoven. 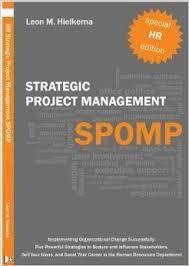 It’s based on the American version “Strategic project management SPOMP. Five powerful strategies to seduce and influence stakeholders” from Leon Hielkema. The most important success factors of project success are related to support from clients, internal users. In this book you get five strategies that are very powerful in creating commitment for your project. If you combine these five strategies you have the possibility to ‘seduce’ your stakeholders into your change and to support you to be successful in achieving the project objectives. The book is divided in eight chapters. The key parts of the book are the five chapters describing the five strategies and the other smaller chapters are focussing on the benefits of SPOMP and making a career. Every chapter contains several examples. I summarized the five strategies in a handy one-pager. Conclusion. Stakeholder management is explained in several methods like PMBoK, PRINCE2, MSP etc., but with this, easy to read book you can find a lot of pragmatic advice to bring stakeholder management into practice. It complements the method you are using! The book is definitely worthwhile buying. 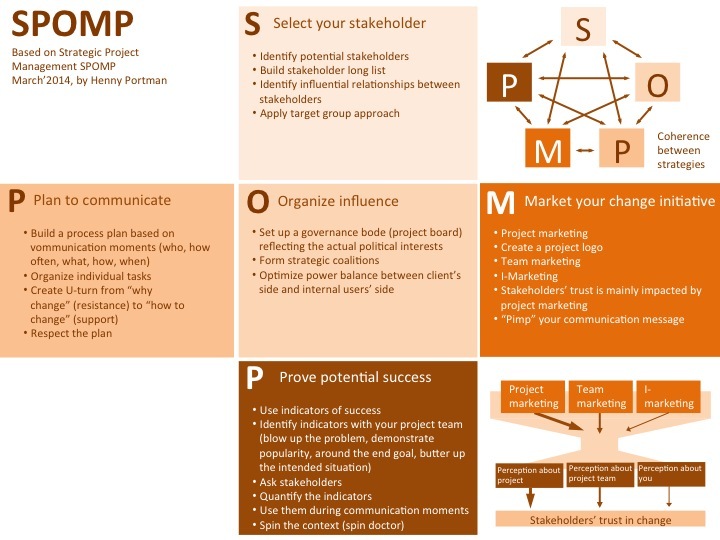 Last week I published a refresh of MSP’ Stakeholder management. Based on feedback I updated the document. To download: MSP (Stakeholder management, 141128) v1.0. E.g. various people responded on the Communication Plan. They call it Engagement Plan, Commitment Plan or Intervention Plan. In MSP it’s called Communication Plan but the other names cover the purpose of the plan too, so choose the one that suits you best. Also I received feedback on the Stakeholder Map. 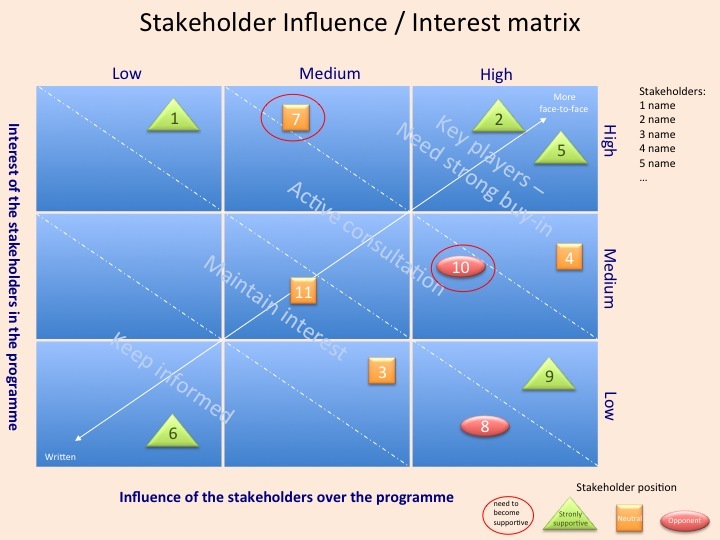 I added the Stakeholder Influence/Interest matrix as shown in the MSP manual and the stakeholder position (strongly supportive, neutral and opponent) and who needs to become supportive for the programme to be successful, is shown too in this map. 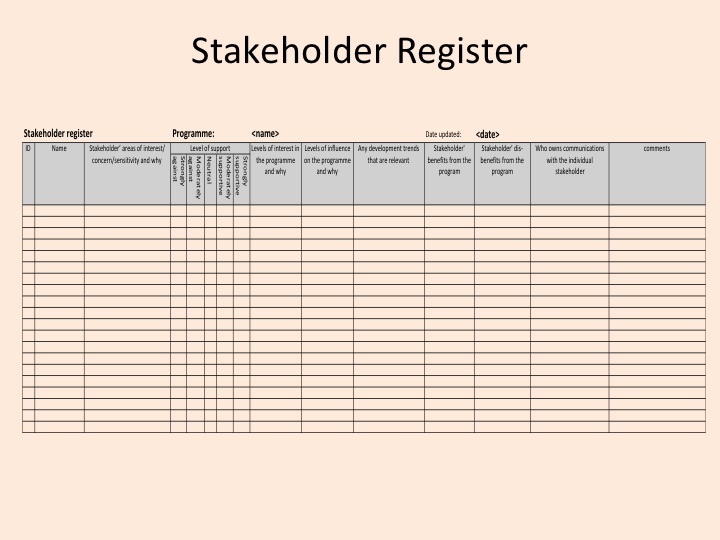 To save time, and become not too bureaucratic, you can use the Stakeholder Register as a substitute for your Stakeholder Profiles. I attached a spreadsheet, which can fulfil this role. Success with the Stakeholder Register! I received questions regarding clarification of stakeholder management from various people. This is a good opportunity to refresh some MSP theory regarding stakeholder management. 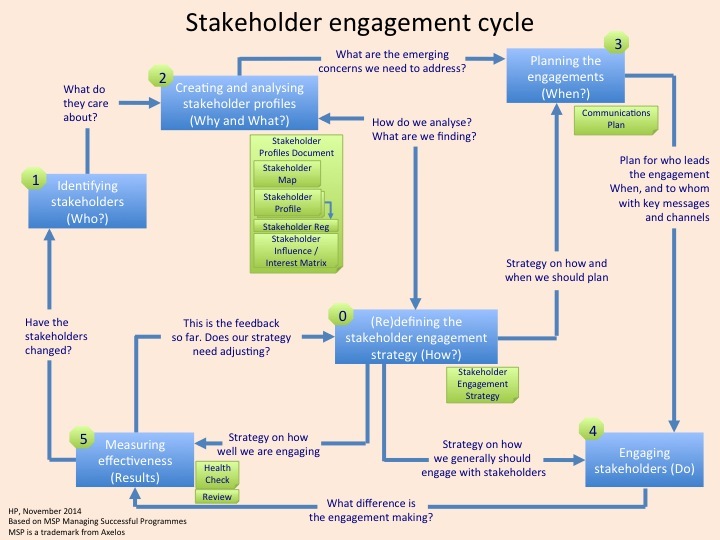 In the middle of the picture you see the Stakeholder Engagement Strategy (0). This strategy, prepared by the Programme Manager during Defining the Programme, describes the framework that will enable effective stakeholder engagement and communication. In other words, the strategy, like all other strategies within PRINCE2 or MSP describes the HOW. Success with the engagement of your stakeholders.